I love the lot I purchased at Coyote Creek. 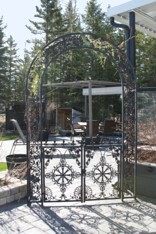 Now I want to personalize it with some landscape work and maybe a shed. Can I do that? We encourage lot owners to give their lot some personal touches and make it their home away from home. 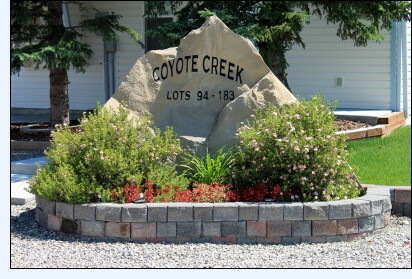 However, because Coyote Creek RV Resort is a registered Condominium Corporation, there are specific regulations and guidelines regarding upgrades you may want to make. If you would like to make changes to your lot, a request must be made in writing to the Resort Manager. The written request should include the changes you would like to complete with as much detail as possible on a plot plan of your lot that you provide. The Resort Manager will, in conjunction with a Board member, make a decision on the approval of the changes. For more information, we encourage you to read your condo Bylaws and Policy Manual that outlines the approvals process. If you have further questions please send an e-mail to the Board or pop by the condo office during specified hours to speak with our Resort Manager. I would like a copy of all the lot owners and their contact information. Who can provide that to me? Due to the Freedom of Information and Protection of Privacy Act, Coyote Creek Condominium Corporation is not at liberty to provide that information. I am a lot owner but do not use the lot myself. Can I rent it out? Yes, as an owner you may rent your lot out. However, it is your responsibility to ensure you and your tenant comply with all the Bylaws of the corporation regarding lot rental. There are easy to follow procedures outlined in your Policy Manual. Additionally, owners should consult the Bylaws for more information. Just a reminder to owner's: lot rental is not part of the job description of the Resort Manager. How do I know when I can water my grass? Although Coyote Creek is located near the Red Deer River with a constant supply of water, we ask all lot owners to remember we do operate on a well system and there is not a limitless supply of water on demand. The system works very well, but there are limitations regarding the storage capacity of the system at any given time. Therefore, we have asked that watering be done on odd and even days. If your lot number is odd, you can water on odd numbered calendar days. If your lot number is even, you can water on even numbered calendar days. To prevent evaporation in the heat of the day, watering can be done first thing in the morning until 9 am and in the evening from 6 pm to dark.